The surprise announcement, exactly two months ago, that Prime Minister Modi had invited and President Obama had agreed to be the chief guest for this year’s Republic Day, had created a sudden frisson of excitement. Certainly very few people, at least in Delhi if not Washington DC, could have predicted such a quick reciprocal visit. That sort of expert endorsement was significant in light of the other narrative that was beginning to spread, that this government was turning out to be diffident about economic reforms. Thus, it was no coincidence that just the previous week the much-criticised spat at WTO had been sorted out, that too to India’s satisfaction. Clearly, the Modi government was banking on foreign policy breakthroughs as a counter narrative to domestic challenges, and proving adept at timing them perfectly. The weeks that followed were initially consumed by domestic controversies, the subsequent deadlock in Rajya Sabha and, not surprisingly, more commentary on government’s perceived diffidence. But then, after a shift of gear and issuance of ordinances on coal block auctions, land acquisitions, and FDI in the insurance sector, that narrative has taken an abrupt about-turn. Discussion on domestic policy has suddenly shifted from whether the Modi government was too timid to whether it was too authoritarian, for attempting to jumpstart the very economic reforms it was being urged to prioritise. However, at least in public discourse, not enough attention has been paid to the details of the parliamentary processes and numbers that will be ultimately required to ratify these ordinances. 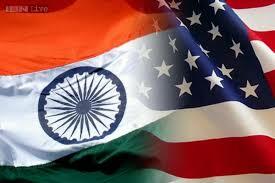 It is in this context that the Obama visit acquires immense significance. To begin with, the optics are dazzling. The first sitting US President to visit India twice, the unprecedented level of security, the denial of the request to lock down Delhi’s airspace, the court comments about why 15,000 CCTVs now being installed couldn’t have happened earlier for Indian citizens’ security, and so on. Beyond the optics, the policy implications are equally impressive. At the very least, there is the potential for delivering big wins that would establish the PM’s reputation as the harbinger of a paradigm shift in defence and possibly other sectors. But some on the Indian side must surely be hoping that there would be a cascading effect afterwards, with the glow of a newly minted reputation as a government whose actions have caught up with its rhetoric helping to unclog the domestic logjam. First described as ‘natural allies’ by then PM Vajpayee during his 2000 visit, the US and India have moved much closer in the decade and a half since. Besides the natural pull of economics, geopolitics has also conspired to push the world’s two largest democracies together, despite their occasional fumbles. It is not as if these two countries see eye to eye on everything. But there is now enough familiarity and comfort in the relationship that disagreements can be acknowledged, and compartmentalised, without risking progress in other areas. Take, for instance, climate change and defence. China and the US reached a deal last year for carbon emissions reduction that has given new momentum to global climate negotiations. With both together accounting for over a third of global emissions, the onus was squarely on them to take the lead. The pressure has been mounting on India, third largest with close to 6% of global emissions. India has been championing a ‘common but differentiated responsibility’, emphasising less burden on and technology transfer to developing countries. But last year also saw the US overtaking Russia to become India’s leading arms supplier. The Defence Trade and Technology Initiative for technology transfer and coproduction is already in the works. America’s visiting Salesperson-in-Chief will undoubtedly close a few more deals. Tellingly, none of this would require legislation in Parliament. What might — or might not, depending on which expert you believe — is a clarification of the nuclear liability law. The US feels that despite facilitating the lifting of nuclear restrictions on India, its suppliers are not getting any of the action. And that India’s subsequent law is far more stringent than global norms, which only the public sector suppliers of Russia and France can meet. Though India’s civil nuclear sector is growing far slower than hoped for, this is nevertheless a big hurdle to cross. Of course, there are many irons in the fire. A key sector expected to get a boost from the presidential visit is renewable energy. With newer technology solar power costs now approaching grid parity, the time may just be ripe for a major deal. Another area that is already blossoming is counter terrorism intelligence sharing. Barring any faux pas, by this time next week the warm afterglow from the visit ought to have melted Delhi’s winter chill, setting the stage for Parliament’s budget session two weeks later.